Adventures in Val Chisone and Around: Winter Has Arrived! Two days a go it was 20 C and now we are lucky if we hit 2! Winter has arrived! 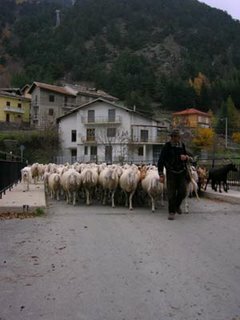 The local shepherds are bringing their sheep off the mountains and our friend Fulvio is beginning his long walk back to the winter grazing pastures in Asti. He will be walking all the way with his 1300 sheep and lambs, several donkeys, countless goats and numerous dogs. A distance of around 120km! This is traditional farming at it's finest. 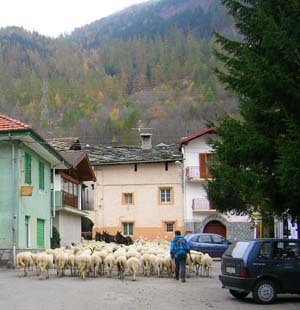 On his way down, the sheep pass through our village. For a short few seconds it reminds me of the "old days" working in London and then 5 minutes later it is peaceful again. 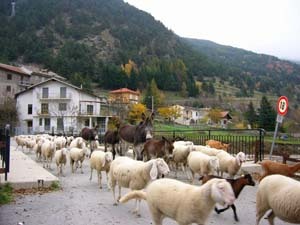 The donkeys are there to provide transport for the newborn lambs, the goats help protect the sheep with the Abruzzeze sheep dogs. The border collies guide and control the flock on its journey. In this area they have to contend with wolves which roam wild and have developed some amazing tactics to take out the odd sheep. The sharp cold snap will bring the wolves down off the mountains as well so they have to keep their wits about them. The white Abbruzzeze dogs are fabulous. They look similar to Labrador or Newfoundlands. They have a lovely temperament and live their lives amongst the sheep. You have to look hard to spot them in the flock. However if you get too close when the shepherd is not in sight then you will discover that they are not always friendly. They are extremely loyal to their masters and their sheep. The beauty of living up here in the Italian Alps is that you get to see these things first hand. Not just a well filmed piece of wildlife documentary. The wolves are there to be seen if you know when and where to look, along with the stembok, deer and chamois. Also you get to see a way of life that has been almost lost in the lands of factory farming and mass production. The other advantage is that you get to eat some of the best lamb you could ever imagine. Lamb that tastes of herbs even though it has not been cooked with any! In France at Mont Saint Michel you can eat Mouton "pre sale" because the sheep there graze on seaweed and the meat takes on the taste. Here you get the taste of rare herbs such as genepy, serpoul and wild thyme for the same reasons. To try this exceptional flavour why not come and stay at The Belvedere? With enough advanced booking we can arrange the freshest roast lamb you will ever have! To follow the routes of the local shepherds please click on the link at the top of the page.